I am far from being at the beginning in the list of authors (and my biggest contribution was to have sampled date palms in situ), but the paper is important: it is indeed the first time that the Wild date palm can be identified. For many crops, wild relatives constitute an extraordinary resource for cultivar improvement and also help to better understand the history of their domestication. However, the wild ancestor species of several perennial crops have not yet been identified. Perennial crops generally present a weak domestication syndrome allowing cultivated individuals to establish feral populations difficult to distinguish from truly wild populations, and there is frequently ongoing gene flow between wild relatives and the crop that might erode most genetic differences. Here we report the discovery of populations of the wild ancestor species of the date palm (Phoenix dactylifera L.), one of the oldest and most important cultivated fruit plants in hot and arid regions of the Old World. We discovered these wild individuals in remote and isolated mountainous locations of Oman. They are genetically more diverse than and distinct from a representative sample of Middle Eastern cultivated date palms and exhibit rounded seed shapes resembling those of a close sister species and archeological samples, but not modern cultivars. Whole-genome sequencing of several wild and cultivated individuals revealed a complex domestication history involving the contribution of at least two wild sources to African cultivated date palms. 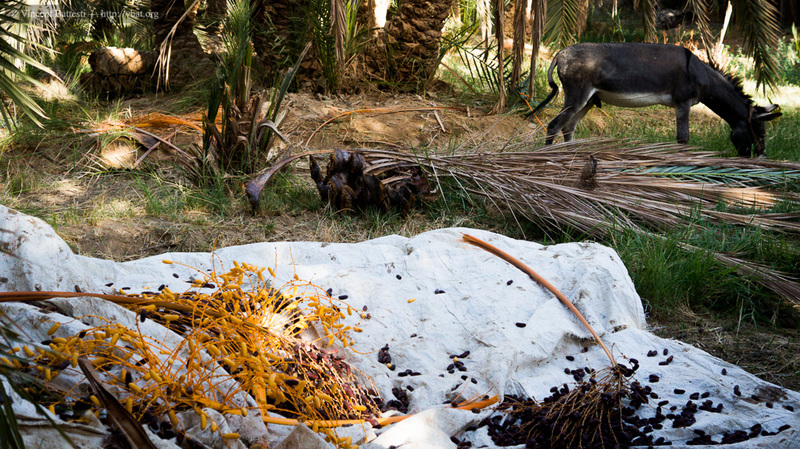 The discovery of wild date palms offers a unique chance to further elucidate the history of this iconic crop that has constituted the cornerstone of traditional oasis polyculture systems for several thousand years. This article has been read 273 times. Dernière mise à jour de cette page le Saturday 28 July 2018 à 5:40:51. //// -----> Citer cette page? Muriel Gros-Balthazard, Marco Galimberti, Athanasios Kousathanas, Claire Newton, Sarah Ivorra, Laure Paradis, Yves Vigouroux, Robert Carter, Margareta Tengberg, Vincent Battesti, Sylvain Santoni, Laurent Falquet, Jean-Christophe Pintaud, Jean-Frédéric Terral, Daniel Wegmann, "The Discovery of Wild Date Palms in Oman Reveals a Complex Domestication History Involving Centers in the Middle East and Africa" [en ligne], in vbat.org anthropoasis, page publiée le 13 July 2017 [visitée le 20 April 2019], disponible sur: http://vbat.org/spip.php?article788.